If a Belize honeymoon sounds like the ticket to paradise that you and your new spouse need after wedding planning, here’s everything you need to know to make sure you have the most enjoyable journey. There’s a reason why more and more couples are enjoying Belize honeymoons than ever before. It’s safe, easily accessible from most places in the United States, affordable and, last but certainly not least, absolutely stunning. Give its location in Central America, bordering both Mexico and Guatemala, its extremely tropical, with almost than half of the country bordering the Caribbean Sea. It’s a great alternative to more popular honeymoon destinations such as Fiji and the Maldives, not to mention far less expensive as well as time-intensive in terms of the plane ride. Here’s everything you need to know to make sure you have the most enjoyable Belize honeymoon. On the long list of reasons why Belize honeymoons are amazing is the fact that the best times to visit are during the dead of winter—quite the opposite of most locations! If you’re wedding falls between the months of November and April, you’re in luck, as the months in between are the most ideal for traveling to this beautiful Central American country. Humidity tends to soar between the months of April and May and are often followed by heavy showers and strong winds from June all the way until mid-November. The temperature in Belize, however, is always climate, hovering right around 80-85 degrees throughout the year. Pretty nice, right?! Perhaps the first stop you’ll make when you arrive at Belize Municipal Airport will be in Belize City, since that’s where the airport is located. While many pass by without spending much time here, it’s worth a visit in its own right. It’s the port city of the Central American country, acting as a gateway for folks entering the borders. There’s much to see and do including a visit to historical sites and attractions such as the Belize Zoo, Museum of Belize, St. Johns Cathedral, The Government House and more. This is probably the most popular spot on Belize’s mainland for visitors, since it’s full of history, culture and nature. While on your Belize honeymoon, tour ancient Mayan ruins, explore peaceful butterfly gardens and lush tropical jungles and have a taste of authentic Belizean cuisine at the fine dining restaurants in the heart of the Cayo District. Honeymooners who love staying physically active have their pick of mountainous hikes or waterfall climbs, which can be found all over Cayo. You can even explore ancient caves and have a swim at the famous, a true hidden gem nestled in 7,200 acres of private forest reserve. 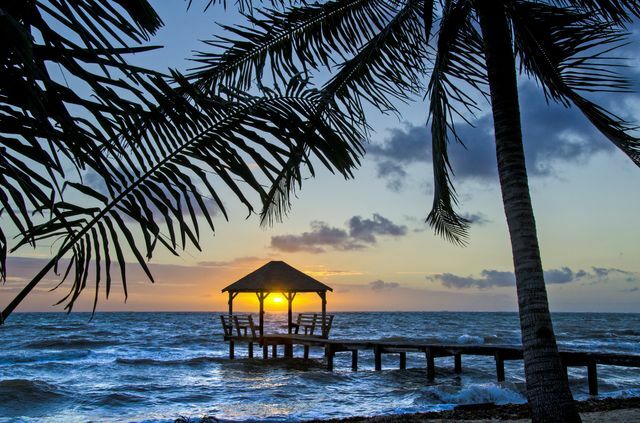 Located 25 miles off the coast of northern Belize sits this stunning tropical island that was once inhabited by Mayans! Today, it welcomes thousands of visitors and Belize honeymooners who are clamoring to catch a glimpse of Belize’s Barrier Reef, the largest of its kind in the entire Northern Hemisphere! It extends all the way from northern Belize’s border with Mexico all the way down to the southern part of the country where it borders Guatemala. Naturally, the favorite activity in Ambergris Caye is snorkeling and deep-sea diving, but if that’s not for you simply find yourself a nice spot on the beach, sit back and relax with your love. Another one of Belize’s most visited islands is Caye Caulker, which sits just south of Ambergris Caye. It’s much smaller, however, extending just four miles long, but is equally relaxing and beautiful. Here, the most popular activities involve snorkeling, scuba diving, deep-sea fishing, sailing, kayaking and simply enjoying the peaceful and pristine atmosphere. It’s easy to get to—less than an hour water taxi from the mainland—and has plenty to eat and drink, so arrive hungry! Any gals past or present with a South/Central America honeymoon? We are wanting to check out Peru and Costa Rica. If so, any tips?! Thank you! We’re planning on going to west palm beach and staying at their Hilton. Anyone had a great time in WPB & want to share the inside scoop of places to eat? Sight see? Adventures?